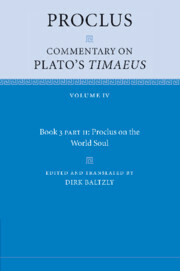 Proclus' commentary on the dialogue Timaeus of Plato (d.347 BC), written in the fifth century AD, is arguably the most important commentary on a text of Plato, offering unparalleled insights into eight centuries of Platonic interpretation. It has had an enormous influence on subsequent Plato scholarship. This edition nevertheless offers the first new translation of the work for nearly two centuries, building on significant recent advances in scholarship on Neoplatonic commentators. It will provide an invaluable record of early interpretations of Plato's dialogue, while also presenting Proclus' own views on the meaning and significance of Platonic philosophy.